Harry Houdini mesmerized a generation of Americans when he was alive, and continues to do so 80 years after his death. This is a "snapshot" of Houdini's life, centering on one of his most famous jumps. 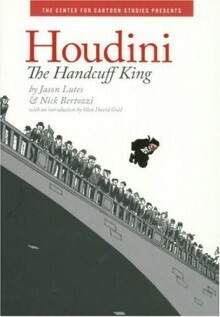 As Houdini prepares for a death-defying leap into the icy Charles River in Boston, biographer Jason Lutes and artist Nick Bertozzi reveal Houdini's life and influence: from the anti-Semitism Houdini fought all his life, to the adulation of the American public; from his hounding by the press, to his loving relationship with his wife Bess; from his egoism to his insecurity; from his public persona -- to the secret behind his most amazing trick! And it's all in graphic form, so it's fresh, original, and unlike anything previously published about this most fascinating of American showmen.